We always seek out fun group costume ideas for the holiday. 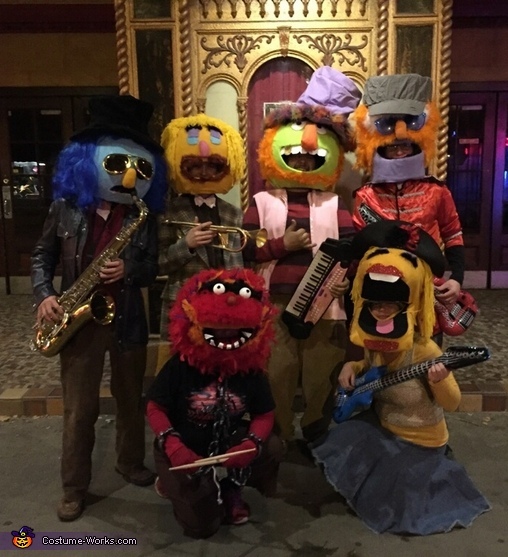 We managed to encourage our friends and co-workers to dress up at go out as Dr. Teeth and the Electric Mayhem. We were stopped all night for pictures and totally played up the Rock Star thing. It was a great night. It is a mixture of a lot of techniques found on the internet and a lot of improv. All started as Paper Mache Balls. We found super sized punching balloons for the bases. Each layer had to dry for at least 24 hours between. We did 5 layers on each. Inside We attached our hard hats with a layer of bubble wrap, Gaffer's Tape, and Left over foam to size for each person to easily view out of. The mouths were cut cardboard to size, covered in black felt, and colored felt for tongues and secured with hot glue. Black Stockings were cut for the back of the mouth so you could easily see through. I used Foam and Chicken wire to make the bases attached to the hard hats. The Chicken wire was cut and formed to shape, then covered in 1/4 inch craft foam. The inside of the mouth was formed with cardboard, covered in felt, and hot glued into place. Each form was covered in Fleece material. I was able to save some by purchasing small fleece blankets. They were stretched around as to be smooth across the face. The back sides didn't matter as much as they were covered later on. Added white teeth made with felt, colored the signature gold tooth with fine glitter. Cut the eye glass pieces from a pair of over sized dollar store sunglasses. His hat was made from purple scrubs, a coat hanger and left over craft wire to form the shape,and hot glued with feathers around the edges. His Hair and beard was made with orange craft feathers his eye brows were black craft feathers. We found his clothes at a thrift store. He was a little tricky as you have to let him see out of the eye holes since the mouth is so small. Cutting Large Eye holes and covering them with oversized sun glasses worked. His hair was a blue costume wig cut on the tracks and hot glued. His hat was made out of an old skirt. The form for it was made out of an old coat hanger and craft wire. His clothes were from the 1970's. He has sleepy eyes. Cut with felt. His Goatee was made with craft feathers. His hair was made with yellow yarn that was unspun to look stringy. His trumpet was made from a tube and a plunger painted gold. He is wearing a 70's style suit from the thrift store. His eyes were made out of Plastic christmas bulbs from the dollar store painted white and his nose a smaller bulb painted red. He was covered with a red boa and accented with purple and orange craft feathers. His eyebrows were also black craft feathers. His teeth were made from Makeup wedges. His chains were plastic from a halloween store, and his clothes from the thrift store. He has oversized glasses. His eyebrows are white feathers and his mustache and hair are orange feathers. His top was a beatles sgt. pepper jacket we found at a thrift store. Her lips were cut from thin glitter foam, here teeth are white felt, her hair was yellow yarn. I recycled a kentucky derby hat we made in the past and added a flower to it. Her outfit was all thrift store finds. Hope this is easy to follow. If you have questions I would be happy to help. It is totally worth it. Overall we made this happen in a week and a half. Several glue gun burns later, we will certainly do this again some time.